It is bright and early on Sunday morning. 7:15 am, to be specific. Addie had a feeding at 6 am, and I put her back down after that, but I am feeling pretty good this morning, despite tons of crying again yesterday, so I am just staying up and trying to get some stuff done. Getting stuff done means watching sportscenter and blogging. I don't feel like I can leave her in her pak n play to go to the basement and hit the treadmill. At least, I don't think so. Our monitor is all set up in her room, so it is not like I can just take that down with me. I will have to wait until she is comfortable and settled later. That kind of thing, and how it will work is still TBD. In addition, how the hubs will handle it. On Friday, Addie and I took a trip to my doctor. I was 4 weeks out from delivery (and Addie was 4 weeks old!) and so I had an appointment to check on my stitches, chat about birth control, etc. I told the doctor that I think I was feeling best if I did go back on the pill, at least for now, so she emailed a prescription over for me right away. She said I could not start taking it until 5 weeks (next Friday) though, so I have not been over to pick it up yet. It is one of those things on the list for this week. I made a list on my phone for the week because I feel like there are some things that I actually hope to accomplish this week. It feels like that is maybe a little unusual since I have been just hoping to survive for the last few weeks. I would be thrilled to accomplish things this week since I have hardly been getting anything done lately. At least, that is what I feel like. It just seems like all I do it baby. And people may argue that this is obviously getting a LOT done, and I know this, at least I am trying to know this, but it still feels like things just are not going the way that I like them to, as far as productivity when J is gone. Yesterday we spent the late afternoon at our favorite bar, just watching the Buckeyes. 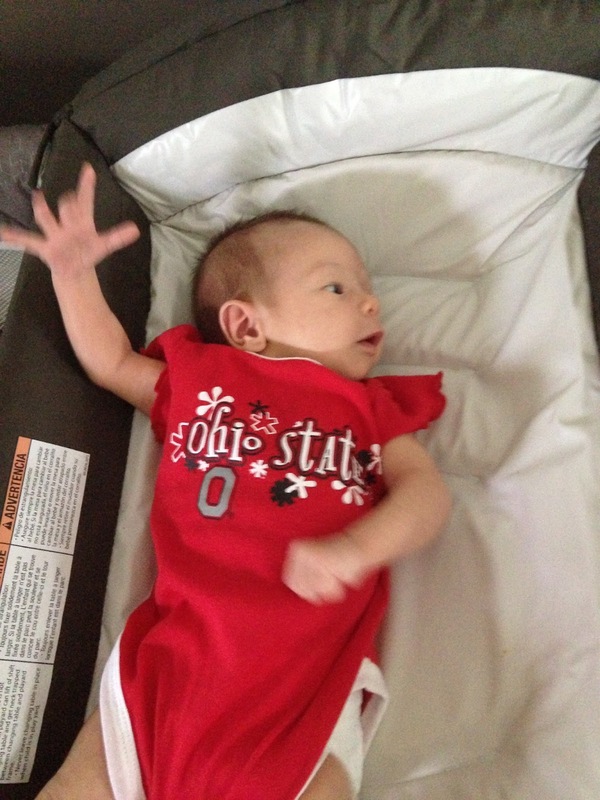 It was the first Buckeyes game that Miss A watched, last week my dad was here and we were busy doing other things. We had to run a few errands, so she missed most of the game. But yesterday, she was PREPARED to watch the game. Thank you to my awesome co-worker Kim for the cute Bucks outfit for her to wear. She was well behaved at the bar for the most part, and by the time we were leaving, she was asleep, as usual. Today I am going to try something new with Miss A and see if it helps the fussiness. We will see!